Everyone else has a web site these days, so I figured, why not me, too? Well, hi, and welcome to passthegravyplease.com. Ok, ok, I know that's not the name, it's more like geocities.com... sorry, getting off the subject. Anyway, for newcomers, I have nine main options so far. First, an About Me page. This will tell you a bit of information about myself (if you really want to know). What's Up Ed gives updates of the website, possibly some interesting things that happen to me, and exciting things happening in the world of Peach Creek. Have any news? Tell me about it. Secondly, an Episode Guide and the "Plank Pick," which is Plank's monthy decision of the top Ed, Edd, 'n Eddy cartoon. It's a catchy name, right? Next are the Character Bios. These tell you what the characters are like and a little bit about them, well, as much as we know anyway. Then the Fan Pages, which gives links to Tales From The Cul-de-sac (fanfiction), Ed-Art (fanart), Ask The Eds, and printable coloring pages. Contribute to my website and I'll put you on. Sixth, an assortment of Games And Fun Stuff from other websites like cartoonnetwork.com and trivial quizzes where you can test your knowledge of the Eds and see which character you are most like. Wanna tell me something important or just want to say hi? See me at Contact Me. Finally, for all you folks that have gotten sick of my website, Links which magically, using the World Wide Web, transport you to other Ed-sites and a few others that have nothing to do with the show I think you'll enjoy. I hope you like our Ed-site for the time being and come again soon! Please be sure to get in touch and let me know what you think of the site. Disclaimer: This is an unofficial Ed, Edd, n' Eddy website. 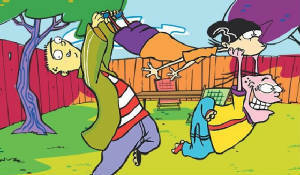 Ed, Edd, n' Eddy is property of Danny Antonucci and Cartoon Network. I'm just fans of a great show.